European datacentre and colocation service provider Colt has cut its annual datacentre electricity consumption by 43GWh (gigawatt hours) since it launched its energy efficiency programme in 2010, saving €4m per annum and reducing its carbon footprint by 15,000 tonnes. Electricity consumption by Europe’s datacentres is projected to reach 104,000GWh – or 104TWh (terawatt hours) – by 2020, up from 60TWh at present. A recent DatacenterDynamics Intelligence report on the global datacentre industry found that energy requirements for IT facilities are growing rapidly. Between 2011 and 2012, power requirements grew by 63% globally to 38GW, up from 24GW in 2011, it revealed. Energy use in datacentres was just 12GW in 2007. In the UK alone, datacentre power requirement is 2.85GW, of which 650MW (megawatts) is outsourced. In addition to its negative effect on the environment, datacentre power use is seen as a rising cost for datacentre managers, who are struggling to minimise IT spend. Energy use currently accounts for 30-50% of datacentre operating costs. There is a pressing demand within the industry for greater IT energy efficiencies to minimise both carbon footprint and energy consumption, warned Colt. 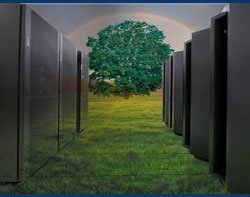 Can a private cloud drive energy efficiency in datacentres? Based on its own savings over the past three years, Colt estimated that the European datacentre industry can aim for a 5% reduction in its annual energy use without significant capital investment. A 5% reduction will lead to a saving of 3TWh of electricity. An industry-wide reduction of this scale would also reduce the industry’s CO2 footprint by more than 1.2 million tonnes and yield savings of almost €300m (£250m) in operating costs per annum. This would provide an environmental impact equivalent to mitigating the total annual electricity consumption of approximately 740,000 households in the UK, according to Colt. The service provider’s energy efficiency programme is applied to all of its European datacentres, including three facilities in the UK. The programme initially focused on data halls, targeting projects that delivered large, upfront gains in energy efficiency over a relatively short period of time. These projects accounted for most of the 10% savings Colt achieved Europe-wide during the first 12 months of the programme. The low or no-investment energy efficiency initiatives included enhanced airflow management, having more accurate energy measurement systems and tighter tolerance bands for cooling air temperature and humidity. During the second and third years, a further reduction of over 8% was achieved, with significant contributions coming from infrastructure projects, which required heavy investment such as upgrading the cooling units, chiller equipment and UPS systems. “From environmental and cost perspectives, substantial energy savings can be achieved by targeting efficiencies within individual data halls and across the entire datacentre infrastructure, both inside and out,” said Ian Dixon, vice-president of operations at Colt. The average age of datacentres across Europe is estimated to be over nine years.